Multiple magnet ingestion is rare, but can cause serious gastrointestinal complications. We report a case of 7-year-old girl with multiple intestinal perforations caused by multiple magnet ingestion. The aim of this report is to draw attention to magnetic toys, results of magnet ingestion and the importance of timing of operation. Foreign body ingestion is common in children. Nearly, 80% of ingested foreign bodies cause no damage and are evacuated spontaneously without intervention. Endoscopic retrieval is required in 10-20%. Surgical intervention is required in only 1% of patients for complications. Multiple magnet ingestion is rare, but can cause serious gastrointestinal complications. The majority of swallowed magnetic objects are components of toy sets. , We report a case of 7-year-old girl with multiple intestinal perforation caused by multiple magnet ingestion. The aim of this report is to draw attention to magnetic toys, results of magnet ingestion and the importance of timing of operation. A 7-year-old girl presented with a 5 days history of abdominal pain, vomiting and diarrhoea. Clinical examination revealed rigidity, guarding and tenderness in the right lower quadrant. Her white blood cell count was 8800 K/μL and C-reactive protein was 34 mg/dl. Other laboratory tests were within the normal limits. An abdominal radiograph showed foreign body in the right lower quadrant and free air below the diaphragm [Figure 1]. When asked to her mother, she remembered that her daughter was playing with such a magnetic toy 1 month ago. Following fluid resuscitation and broad spectrum intravenous antibiotics, a laparotomy was performed. In exploration, we observed that a foreign body, which consists of 10 small pieces of magnets perforated ileum and eventually has stuck into meso at 20 cm proximal to the ileocecal valve. Fortunately, since the magnets are not very strong, the vessels are spared and there was no vascular damage. We also found two more perforations at the ileum [Figure 2]. There was no faecal soilage in the peritoneal cavity. Magnets were removed and the perforations were primarily sutured. Post-operative period was uneventful. Patient was discharged on the 7 th post-operative day. Although known magnet ingestion is rare, to date, more than 100 patients have been reported with ingestion of magnetic foreign bodies. , Solitary magnet ingestion usually does not cause any complications, but multiple magnet or one magnet and a metal object ingestion can cause serious gastrointestinal complications. Attraction of multiple magnets across the walls of multiple loops of bowel leads to ischaemia and necrosis of trapped bowel wall, which results in serious complications such as bowel obstruction, perforation, fistula formation, volvulus, intraperitoneal haemorrhage and even death. , Multiple magnet caused multiple intestinal perforations in presented case. Since the magnets are not very strong, the vessels are spared and there was no vascular damage in the presented case. Management of magnet ingestion is controversial. If ingested magnet is single, it could pass out like any other foreign bodies without any complication and usually intervention is not required. If multiple magnets are ingested, further evaluation is required to prevent complications. Magnets in the oesophagus or in the stomach may be safely retrieved via endoscopy. When the patient admitted with signs of intestinal obstruction or perforation, an urgent abdominal exploration is inevitable. However, different approaches were suggested, if the magnets have passed the stomach in asymptomatic patients. Some authors ,, proposed that close monitoring with serial abdominal X-rays and surgical intervention if abdominal symptoms which are signs of intestinal obstruction or perforation develop, whereas some authors ,, approached aggressively so that they suggest early surgical intervention when physician cannot remove the magnets via endoscopy. Tsai et al. have recommended more detailed algorithm for management of asymptomatic patients. According to this algorithm, laparoscopic-assisted exploration and/or endoscopy should be performed in following situations: (i) The magnets are seperated and (ii) magnets are attached to each other and symptoms of abdominal distress develop and/or no distal migration of foreign bodies which can cause entrapping bowel were seen on serial images. However, migration of attached magnets do not always indicate that there will not develop any complications. Butterworth and Feltis observed intestinal perforations in their case although magnets moved distally. Another problem is that, multiple small attached magnets can be seen as a single object on X-ray which could not led to predict present or future complications. In presented case, the 10 small pieces of magnets had adhered to each other and they were seen as one metallic stick on radiograph. Because of her physical examination revealed signs of intestinal perforation and free air were observed on radiograph, we performed urgent laparotomy. When radiographs re-examined magnets were observed in series. However, if the patient would have admitted without complication, this false perception might cause delay in intervention. We believe that, since the multiple magnet ingestion has a potential life-threatening complication such as mesenteric vascular haemorrhage, all magnets should be removed urgently. The majority of swallowed magnetic objects are components of toy sets. Thus, some educational and preventative measures are required to minimise the likelihood of ingestion. Media has an important role to provide awareness about this issue. Parents should be informed about potential dangers of this kind of toys and objects. Toys with magnetic component should not be kept at home. Parents and caregivers should be aware of the risks of swallowed magnets and be careful when choosing toys and they should not buy such dangerous toys to their children. Another important point is that parents and caregivers should not think that the ingested magnet, even if it is small, could pass spontaneously like other harmless objects and they should take the child to hospital promptly. Manufacturers of such products should also be aware of this dangerous situation and seek alternative ways to immobilise the magnets in fabrication process. Ideally, the construction and sale of such toys should be standardised by authorities. Toys should have warning labels on the their packages and it should be emphasised that it can cause serious illness even life-threatening conditions if children swallow such hazardous magnets. Finally, clinicians who care for children should be alert about magnet ingestion and when a patient presents with metallic foreign body ingestion, even if there is no symptom, they should suspect of magnet ingestion to be able to make early and rapid evaluation. 1. Kay M, Wyllie R. Pediatric foreign bodies and their management. Curr Gastroenterol Rep 2005;7:212-8. 2. Lee BK, Ryu HH, Moon JM, Jeung KW. Bowel perforations induced by multiple magnet ingestion. Emerg Med Australas 2010;22:189-91. 3. Oestreich AE. Worldwide survey of damage from swallowing multiple magnets. Pediatr Radiol 2009;39:142-7. 4. 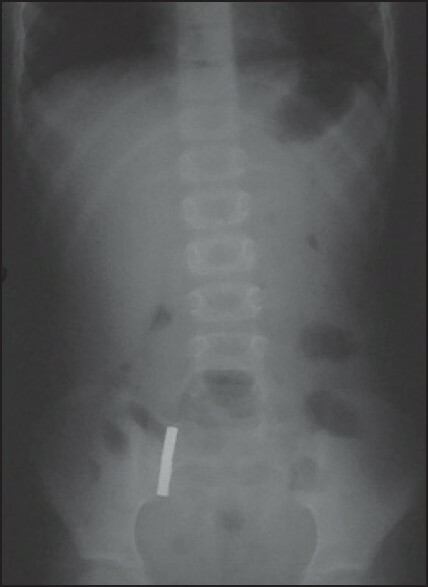 Liu S, Li J, Lv Y. Gastrointestinal damage caused by swallowing multiple magnets. Front Med 2012;6:280-7. 5. Butterworth J, Feltis B. Toy magnet ingestion in children: Revising the algorithm. J Pediatr Surg 2007;42:e3-5. 6. Tsai J, Shaul DB, Sydorak RM, Lau ST, Akmal Y, Rodriguez K. Ingestion of magnetic toys: Report of serious complications requiring surgical intervention and a proposed management algorithm. Perm J 2013;17:11-4. 7. Nui A, Hirama T, Katsuramaki T, Maeda T, Meguro M, Nagayama M, et al. An intestinal volvulus caused by multiple magnet ingestion: An unexpected risk in children. J Pediatr Surg 2005;40:e9-11. 8. Wong HH, Phillips BA. Opposites attract: A case of magnet ingestion. CJEM 2009;11:493-5. 9. Hernández Anselmi E, Gutiérrez San Román C, Barrios Fontoba JE, Ayuso González L, Valdés Dieguez E, Lluna González J, et al. Intestinal perforation caused by magnetic toys. J Pediatr Surg 2007;42:E13-6. 10. 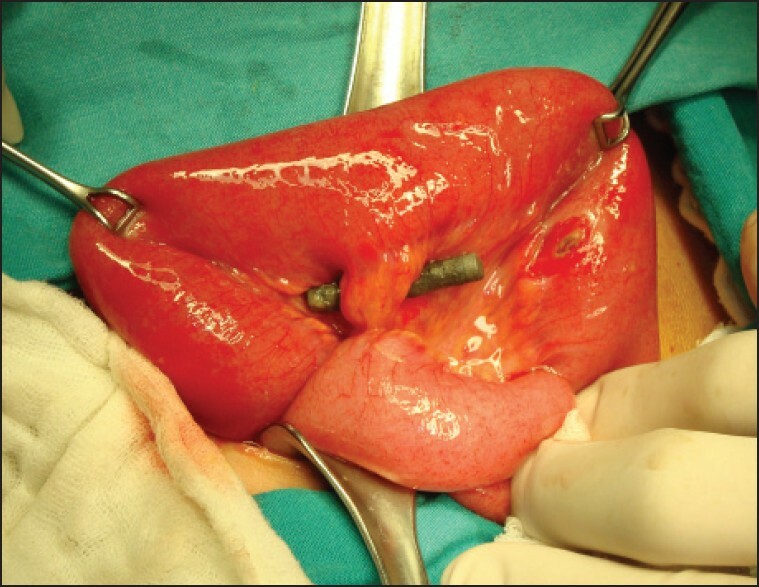 Vijaysadan V, Perez M, Kuo D. Revisiting swallowed troubles: Intestinal complications caused by two magnets - A case report, review and proposed revision to the algorithm for the management of foreign body ingestion. J Am Board Fam Med 2006;19:511-6.